The Islamic State has released a new propaganda video celebrating the recent terror attacks in Paris and showing images of Times Square as fighters make vague threats against France and the U.S., which U.S. law enforcement officials say are not new. The video contains images of Times Square, Herald Square and Central Park that were originally published in April. 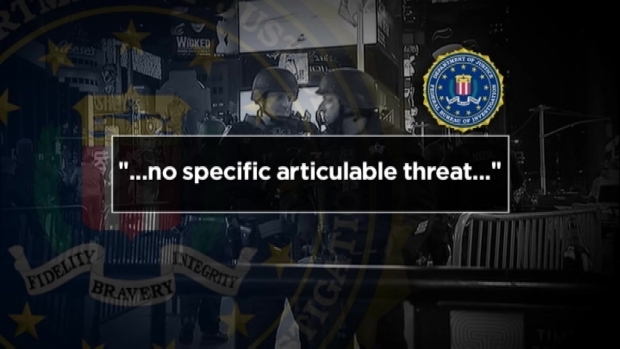 Senior law enforcement officials say there is no new specific threat information to New York, and one official called it more propaganda from ISIS. The video shows French-speaking and Arabic-speaking fighters, including a child, discussing the "successful" operation in Paris last week. The video also mentions France and the U.K., but there was no specific threat directed against the countries, either. Officials stressed the video contained no specific and credible threat against New York City. The Islamic State has released a new propaganda video celebrating the recent terror attacks in Paris and showing images of Times Square as fighters make vague threats against France and the U.S., which U.S. law enforcement officials said are not new. Chief Investigative Reporter Jonathan Dienst has more. "To be quite frank with you, there's nothing new about the video," NYPD Commissioner Bill Bratton said at a news conference at Times Square late Wednesday night. "The video, our review of it, it looks like it's been hastily produced, it looks like a mish-mash of previously released video," Bratton said, noting snippets from another video targeted against Germany in August and one against Israel in October. About 19 seconds of the five-and-a-half minute video showed shots of New York City, he said. "In New York, we understand that we are a terrorist target. It reflects the importance of the city," Bratton acknowledged. But he stressed that the NYPD has counterterrorism tools and systems in place and partnerships with the FBI and other government agencies that make New York the best prepared city to protect and defend against a terrorist attack. He and Mayor de Blasio also highlighted the additional Critical Response Command teams that have been deployed throughout the city out of an abundance of caution. "The people of New York City can rest assured that extraordinary efforts are being made every single day to keep them safe," Bratton said. The NYPD has its officers out in full force, even in areas known as soft targets like bustling restaurants and bars. Marc Santia reports. "As we move into this time of year of great celebration and great activity... people can feel comfortable coming into the city, enjoy themselves, celebrate," he said. "Be aware, but do not be afraid. The NYPD will protect you." 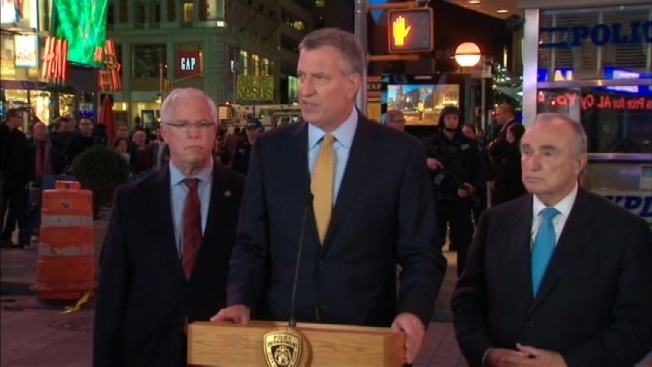 Mayor de Blasio also urged New Yorkers to continue to go about their business normally. "It is the goal of terrorists to intimidate and disrupt our democratic society," he said at the news conference. "We will not submit to their wishes." At the same time, Bratton and de Blasio asked New Yorkers to remain vigilant and report any suspicious activity to authorities. There has been a heavy police presence across New York City since the Paris attacks, particularly at key transit hubs like Grand Central Terminal, as well as at so-called soft targets like theaters and stores. Police Commissioner Bill Bratton said earlier Wednesday he has no security concerns about the Macy's Thanksgiving Day Parade next week and that he'll be there himself "happily watching" with his family.